I am still pretty new so take this with a grain of salt. I have rarely heard of a good relationship between gliders and cats and dogs. Even when friendly a swipe from a dog or cat could kill and both dogs and cats are predators. They are probably okay if they are in their cage but play time in the open could quickly turn deadly. I got mine from The Pet Glider. They were flown in in great condition and I have no complaints. I kind of wish I had looked more for rescues now and I did a little but did not find any near me except one that seemed really scammy. If you are planning to get three or four you may want to try to get an already bonded group and avoid the stress I went through. I use some pet safe cleaner but cannot remember the brand. I mostly just scrub with water and a bit of that. I use a car wash mitt to get between the bars. A lot of the smell will be on the toys and floors inside so I soak those once a week. The Congo cage pieces except for the walls and roof can all be pulled out and soaked too. The evening after cleaning day they all start rubbing themselves all over to mark the cage again. I try to have at least three places to sleep for my four gliders in case they are not all getting along. I think you would want at least two places. When Dobby and Elric were living alone I accidentally only left out one pouch. Elric slept in it and Dobby wanted to be alone for whatever reason and he meticulously reached through the bars and pulled up the lining and made a fort to sleep in. I came in before going to work and pulled it up thinking they were just playing to find Dobby looking haggard underneath it. I gave him another pouch with some blankets and he gratefully dived right in. Most night all four sleep in one pouch but sometimes one is alone or they are in two and two. Dobby and Arwen in particular seem to like going camping about once a week and sleep in the hammock. For liners I got a set from Jana’s shop (she advertises here). Seems to absorb smell pretty well. I just shake it out once a day and throw it in the washing machine once a week. If you go that routeI would get two so you have one when you are laundering the other. For treats I use yogurt drops (everyone except Eilonwy likes them most of the time), dried coconut (Eilonwy and Dobby like them and the others will occasionally want one) and mostly use kibbles from Critter Love as foraging snacks. Some days I will give them fresh fruit as a snack. Mine all love blueberries. Every other week or so I feed them freeze dried chicken necks. The first time the girls did not want them but the boys devoured them. I tried to lure Elric with one to come to the other side of the cage to eat and he immediately jumped onto my hand to make sure this delicacy did not escape. I think the girls were too young (a month younger then boys) to want chicken the first because now they devour it too. I fed them these last night and despite giving them four Elric and Dobby were wrestling for one. Arwen was smart and took hers and hid on the upper level. Eventually Dobby got tired of Elric trying to eat his and took up to the hammock. I am not qualified to comment much on the medical side so I will leave that to the experienced. Last edited by Xeno; 03/18/19 02:59 PM. Please take a moment to register so you can take full use of the forum. My comments will be in red. I plan on getting 2 females to start with, and if things go well -- I'd get another pair -- maybe 1 of which will be male if I'm feeling brave. I've heard the males tend to mark stuff and therefore "smell" more even when neutered, so I was holding off on getting males for now. Intact boys can be odoriferous little chaps. Intact boys smell better, if not at all. [*]nightlight -- I'm trying to find a red LED one, just in case they need it. I just use a regular nightlight. [*]liners for the cage tray -- what do you all recommend to use? I don't use anything in my cage pans, you can just wipe it out daily with a wipe, I would spray them with alcohol and wipe with a paper towel when I only had a couple cages. [*]food -- there's so much controversy with the different diets out there so I'm not sure what to do. Worst case, I figured I could wait and see what the breeder was currently feeding them and go from there. Or should I handle this another way? Diet is a hot topic! I recommend of the diets that has been tested, which are the Critterlove diets, BML and the Pocket Pets diet. TPG is widely known but it was evaluated on paper and shown to be a diet with too many variables and the animal nutritionist, Dr. Deirenfeld didn't recommend it. Dr. Deirenfeld is a well respected animal nutritionist that has spoke all over the world. [*]e-collar/e-jacket -- which one would be better? Or is this only necessary if you've got a male to be neutered? I recommend you have both, a set of three jackets (three sizes) and an e-collar. You never know what injuries the little guys are going to get. [*]emergency kit -- what should be included in the kit (other than the e-jacket/collar)? I would talk to your vet about that, I run a rescue so the stuff in my HUGE kit you are not going to need. My vet keeps me well stocked. 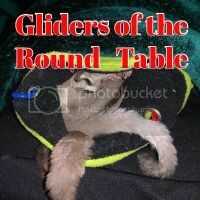 [*]veterinarian-- I have one on my list that's experienced but they're about an hour away, so I'm still waiting to hear back from my regular vet (15min away) to see if they have any glider experience. I would use both, your exotic vet for most stuff and the closer vet for emergencies to stabilize the gliders until you can get to the exotic vet. I utilize 4 different vets, it just depends on what the problem is. Please take a few moments to register so you can take full advantage of the forums. I'm new myself , I have just realized I have a breeding pair and dealing with joeys now which is not a big deal as the parents are doing a good job. I'll only comment on my experience so far. Two females, if bonded, should be fine but if your getting young ones they may fight with each other as they reach puberty as I've read on these forums females are shun and males are ignored. As far as the male marking or being more smelly, depends on if he's neutered or not. My male is not and has a bald spot on his head and an obvious mark on his chest from marking his territory. But even with that, smell is only a problem if you don't keep up with cleaning. The cage will smell terrible if you don't clean it for a week either way. I have 2 sets of cage fleece options for laundry swap out. I have the largest reasonably priced cage I could find so lots of fleece in there. Mine is the knockoff version of the Congo. Cheaper door locks but other than that i dont see any real issues and it was less then half the cost of the Congo. Upkeep is very important to smell. I personally can't smell mine (cage in my bedroom) unless I let the drop pan go more then 2 days or the fleece more then a week or much longer for pieces they don't use so much. The cage liners I have are from someone on this web site and are very good. I got 2 so when I change it out I have a second immediately available and immediately toss the other in the washer with some arm&hammer oxi clean tab and I use the opportunity to clean some fleece at the same time. The liner doesn't even need the dryer as it's basically dry after the spin cycle and I hang it. I won't comment on diet. Treats fall in that category so won't talk about that either. But having available what the breeder fed them would be appropriate as you can change the diet slowly after that. I have never read anything about a night light and mine have no trouble navigating the cage in almost pure darkness. They prove this nightly running on a wheel from 3-5am. I see no need for more then one owner bonding pouch. Mine is nice fleece with a peek thru mesh and zippered. However, I have 4 sleeping pouches available that I switch out. They seem to only prefer one that is a single mount round pouch which seems to close more naturally with weight then the 2 point mount flat pouches. The foraging toys are great but you may buy one they simply won't play with even with a treat in there. I made a ball pit with a $0.97 Wal-Mart plastic bin, pingpong balls and 2 cat treat balls that they seem to enjoy. Oh and the other pets.. I've read that dogs don't see them as food but cats do. I'm not sure if I'd allow any contact with cats as a kill can happen in seconds. 0 registered members (), 20 guests, and 282 spiders. 20,217,669 I just found a lump on Timmy's chest--HELP!